Bristol City boosted their hopes of Championship survival as they thrashed struggling Bolton Wanderers. Aaron Wilbraham gave the hosts an early lead with a tap-in after Bolton keeper Paul Rachubka denied Joe Bryan. Lee Tomlin scored from Nathan Baker's long ball, Peter Odemwingie made it 3-0 from distance and Scott Wagstaff tapped in Jonathan Kodjia's pass. Kodjia then headed home Adam Matthews' delivery and Bryan's right-foot strike completed the rout for City. The Robins remain 19th in the Championship table but are now six points clear of the relegation places, with eight games remaining, by virtue of MK Dons' defeat by Brighton. It was an afternoon to forget for interim Bolton boss Jimmy Phillips - who took charge of the first team after former manager Neil Lennon left by mutual consent on Tuesday - as his side struggled to work their way back into the game following the hosts' early double strike. The Trotters eased their financial troubles after confirming they had paid their outstanding £2.2m tax bill this week, but their slim hopes of Championship survival now look even more unlikely following the defeat. They have gone eight games without a win in the league, remain rooted to the foot of the table and are 12 points from safety with eight games left. Meanwhile, City's fine display was the first time Lee Johnson's side have scored more than three goals in a game this season, having achieved that feat 19 times in all competitions last term. Bristol City head coach Lee Johnson: "The dressing room was quiet before the game and I didn't know quite what to make of it. Thankfully, it proved the calm before the storm. "The players were desperate to show the good side of Bristol City after the week we had been through as a group and I think they deserve huge credit. "But there is still so much room for improvement and, with clubs near the bottom picking up points everywhere, we have to maintain standards. "I want to finish as high as possible in the table to set down a marker for next season." Bolton interim boss Jimmy Phillips: "I want to apologise to the Bolton fans who made the trip. It is one of the lowest points of my long association with the club. "I possibly felt worse when we were relegated on the last day of the Premier League season while I was a player, but it's similar today. "It certainly pushes us closer to League One, but I won't give up the fight. "The new owners and the fans deserve nothing less than 100% commitment from everyone involved until it is mathematically impossible for us to stay up." Match ends, Bristol City 6, Bolton Wanderers 0. Second Half ends, Bristol City 6, Bolton Wanderers 0. Attempt blocked. Luke Freeman (Bristol City) right footed shot from the left side of the box is blocked. Assisted by Joe Bryan. Attempt saved. Gary Madine (Bolton Wanderers) right footed shot from outside the box is saved in the bottom left corner. Assisted by Stephen Dobbie. Goal! Bristol City 6, Bolton Wanderers 0. Joe Bryan (Bristol City) right footed shot from the right side of the box to the bottom left corner following a fast break. Attempt blocked. Joe Bryan (Bristol City) left footed shot from outside the box is blocked. Assisted by Luke Freeman. Goal! Bristol City 5, Bolton Wanderers 0. Jonathan Kodjia (Bristol City) header from the centre of the box to the top left corner. Assisted by Adam Matthews with a cross. Attempt missed. Darren Pratley (Bolton Wanderers) header from the centre of the box is just a bit too high. Assisted by Stephen Dobbie with a cross following a corner. Corner, Bolton Wanderers. Conceded by Marlon Pack. Substitution, Bolton Wanderers. Stephen Dobbie replaces Wellington because of an injury. Goal! Bristol City 4, Bolton Wanderers 0. Scott Wagstaff (Bristol City) right footed shot from very close range to the centre of the goal. Assisted by Jonathan Kodjia with a cross. Corner, Bristol City. Conceded by Rob Holding. Offside, Bristol City. Luke Freeman tries a through ball, but Jonathan Kodjia is caught offside. Attempt saved. Luke Freeman (Bristol City) left footed shot from outside the box is saved in the centre of the goal. Assisted by Lee Tomlin. Substitution, Bristol City. Luke Freeman replaces Bobby Reid. Lee Tomlin (Bristol City) wins a free kick on the right wing. Dean Moxey (Bolton Wanderers) is shown the yellow card for a bad foul. Substitution, Bolton Wanderers. Wellington replaces Tom Walker. Substitution, Bristol City. Jonathan Kodjia replaces Aaron Wilbraham. Aaron Wilbraham (Bristol City) wins a free kick in the attacking half. Offside, Bristol City. Adam Matthews tries a through ball, but Aaron Wilbraham is caught offside. Corner, Bristol City. Conceded by Dean Moxey. Attempt missed. Tom Walker (Bolton Wanderers) right footed shot from the centre of the box is high and wide to the right. Assisted by Gary Madine. Goal! Bristol City 3, Bolton Wanderers 0. 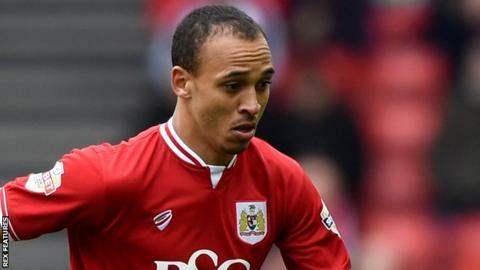 Peter Odemwingie (Bristol City) left footed shot from outside the box to the bottom right corner. Assisted by Aaron Wilbraham with a headed pass. Attempt missed. Aaron Wilbraham (Bristol City) right footed shot from outside the box misses to the left. Assisted by Lee Tomlin. Josh Vela (Bolton Wanderers) is shown the yellow card. Second Half begins Bristol City 2, Bolton Wanderers 0. Substitution, Bolton Wanderers. Neil Danns replaces Mark Davies. First Half ends, Bristol City 2, Bolton Wanderers 0.